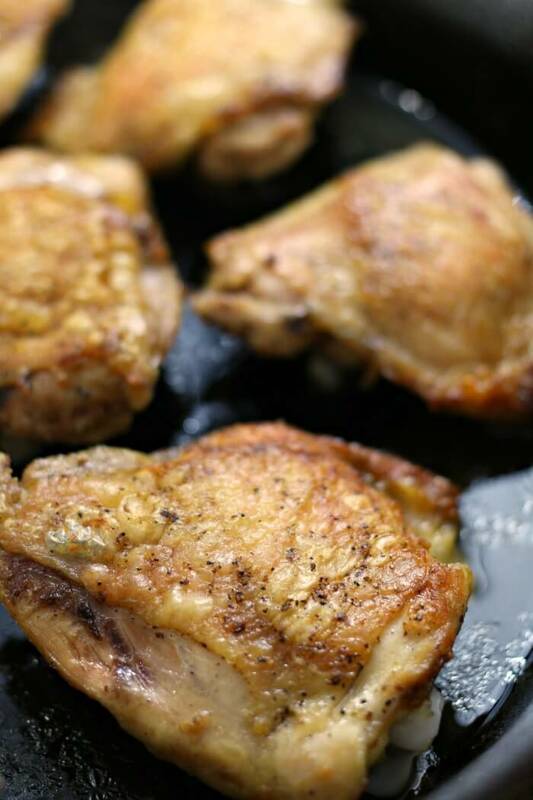 Crispy Chicken Thighs are started on the stove top and finished in the oven to make a deliciously simple but addicting chicken dish. These crispy chicken thighs are such a big hit in our house. We like to serve crispy baked chicken thighs with roasted carrots and broccoli slaw. There are never leftovers! 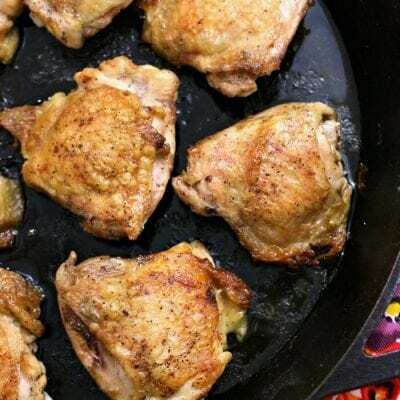 Chicken – Bone-in chicken thighs with skin is what you’re looking for to make the perfect crispy chicken thighs. 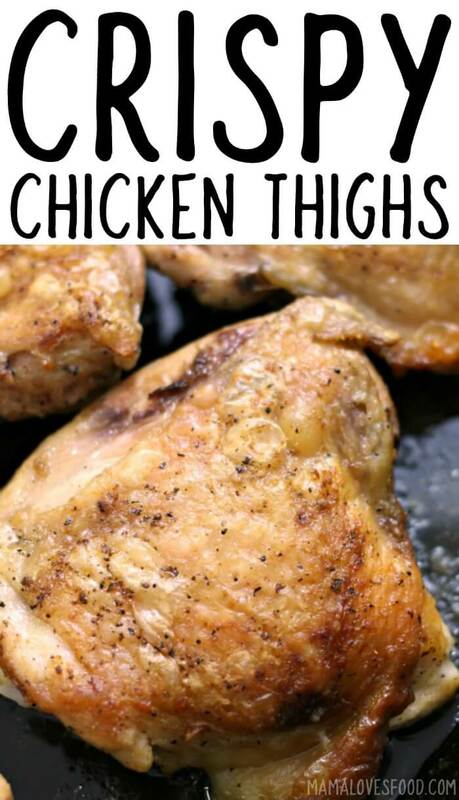 This recipe does not work with skinless chicken thighs. Please don’t try it, you’ll be very disappointing. Oil – I usually use olive oil, but rendered bacon fat works well too as it has a higher smoke point and you’re using a very hot pan in this recipe. Seasoning – Keep it basic. I like this simple spice rub recipe, or just a pinch of salt and pepper. How do you get crispy chicken skin? 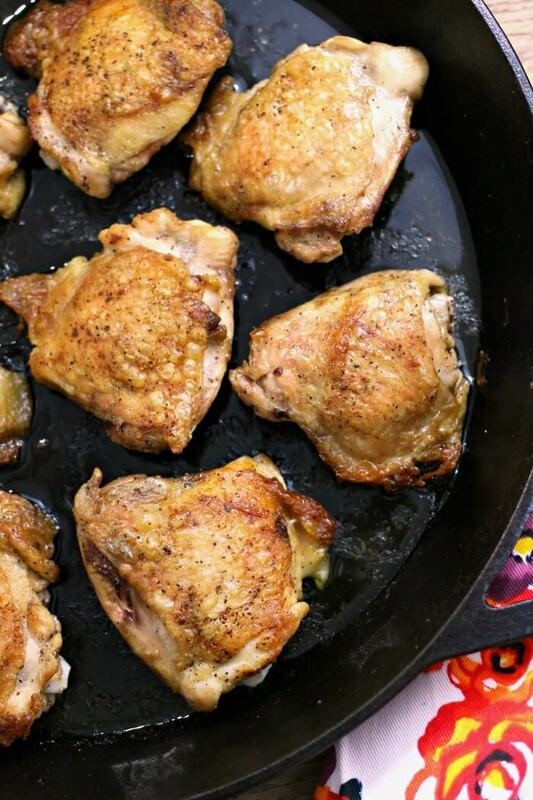 To get crispy chicken skin on your crispy chicken thighs, you need to start your chicken on the stove top, preferably in a cast iron skillet. I like to use rendered bacon grease, but vegetable oil, or olive oil would work as well. Cook the chicken skin side down in a thin layer of hot grease or oil. The chicken will spend most of it’s time cooking skin side down – first on the stove top, and then in the oven. In the last few minutes of cooking, you’ll flip the chicken thighs over to finish. You’ll want to stick with minimal seasoning on your crispy chicken thighs because the dish stands alone really nicely. I like to use my simple spice rub, or some seasoned salt, and sometimes even just a sprinkle of salt and pepper! 15-inch Cast Iron Skillet – I have two of these massive cast iron skillets and they’re some of my favorite pans ever! You’ve definitely seen us use them many times on the live show (including the time we made these crispy chicken thighs!). 16-inch Tongs – A super long pair of tongs is so important for a recipe like this. There’s nothing worse than a bunch of grease splatter burns up your arm because you tried to use a fork to flip your chicken. These are ideal for a hot grill too. Grease Splatter Guard – I inherited one of these grease splatter guards from my grandmother several years ago and have found myself using it several times a week. Even though we fry our bacon in the oven now, I still use it for this crispy skin chicken and so many other recipes. You can also watch us make these Crispy Chicken Thighs on YouTube! Make sure to tune in for all our live cooking shows! Season chicken lightly with spice rub or salt and pepper. Heat a layer of fat or oil in a large oven safe skillet on the stove top (preferably cast iron). Place chicken skin side down in the hot skillet, for 10 - 15 minutes until chicken skin is beginning to brown and crisp. 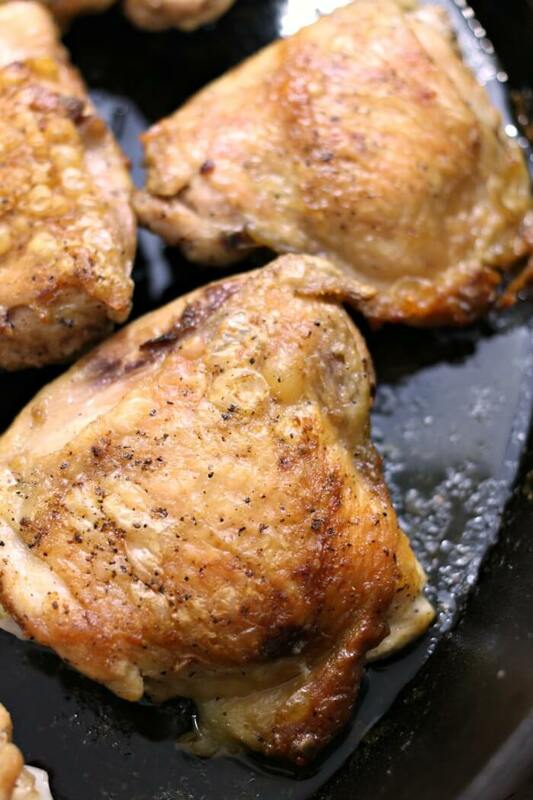 Shift chicken once or twice in the skillet to make sure it’s not sticking. Transfer to a 425 degree oven and continue cooking chicken skin side down for an additional ten minutes. Oh mercy! It’s midnight and my mouth is watering looking at those beautiful crispy chicken thighs! Maybe I’ll make a PBJ to get me through the night…. Do you know if you put salt in the bottom if your cast iron pan, it will cut down on splattering? Plus, not to be rude or anything, but you do way too much chattering on everything but the cooking. Don’t really care to hear your hellos to everyone? I agree – don’t criticize. If you don’t like the website, no one is making you read it. The rest of us enjoy it. INFORMATION. TO HELP WITH. FAMILY. THANK YOU!!! !